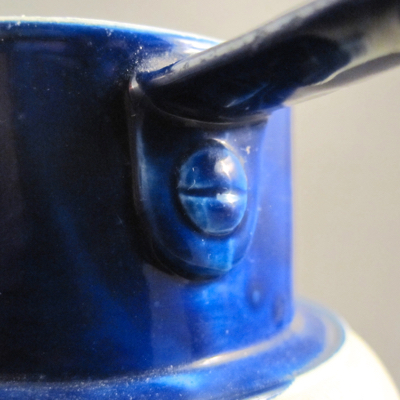 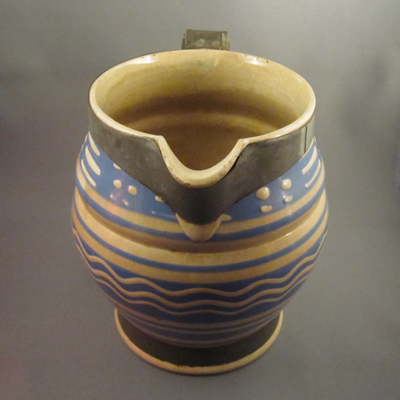 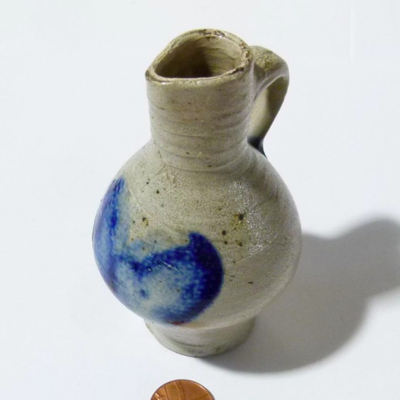 This tiny hand-thrown, salt glazed, baluster form stoneware jug with cobalt decoration was a mystery to me when I purchased it two years ago. 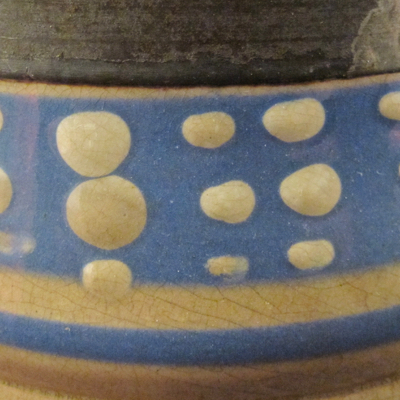 I found it in Hawaii, of all places, and the dealer knew nothing about it. 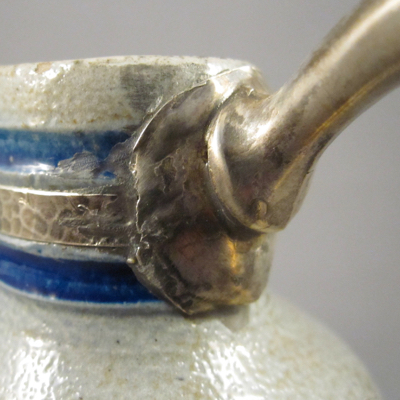 The unusual silver replacement handle with a hand hammered band, and what appears to be a coiled snake at the base, threw me off. 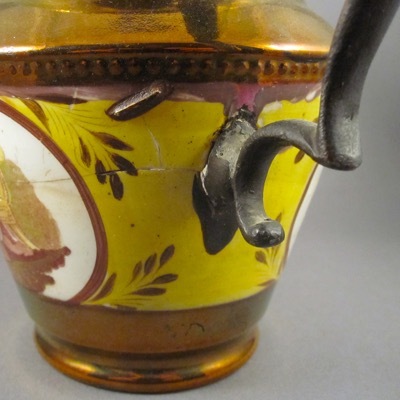 These details gave off a 70s vibe – more 1970s than 1770s. 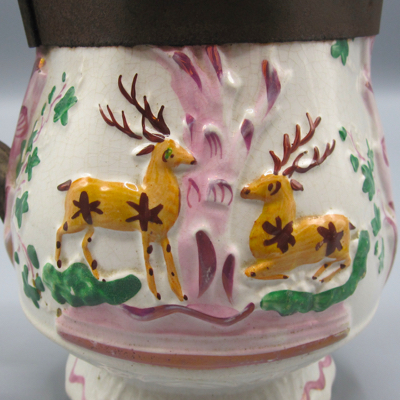 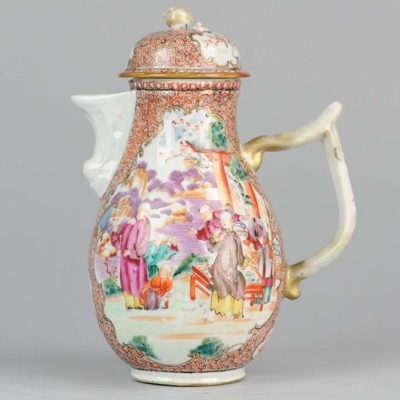 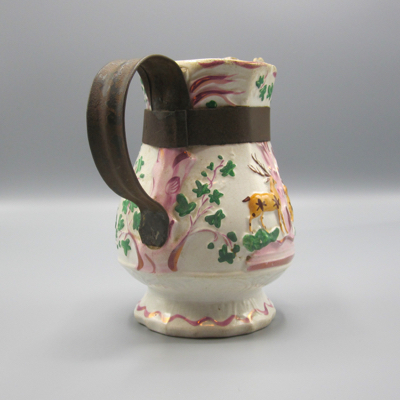 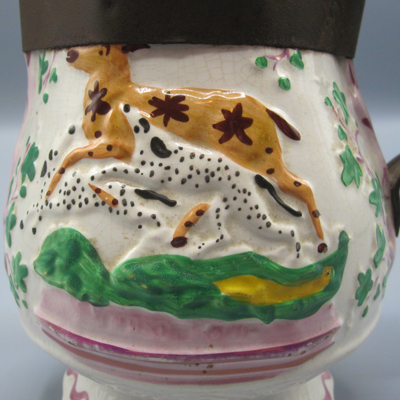 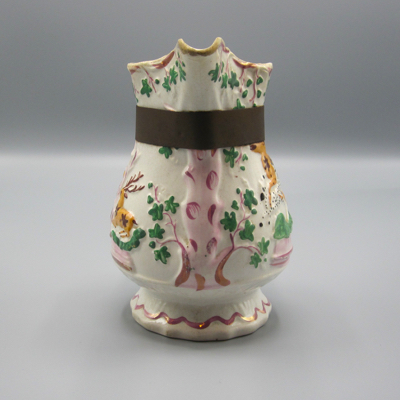 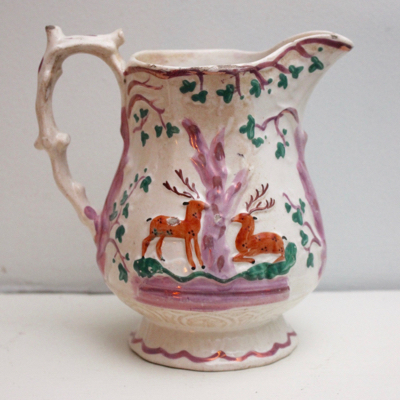 After a bit of research I discovered I had a miniature Westerwald jug, made in Germany around 1750 and possibly earlier. 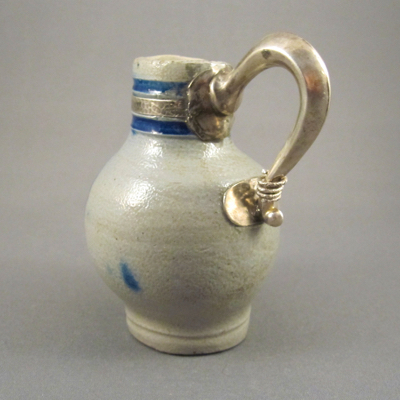 It stands just 3.5 inches high. 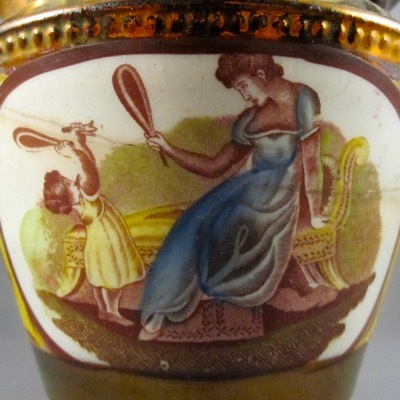 Not all miniatures were made for children to play with. 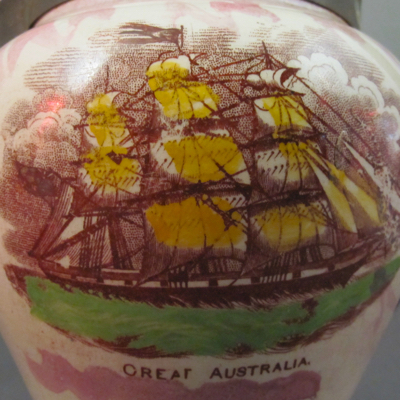 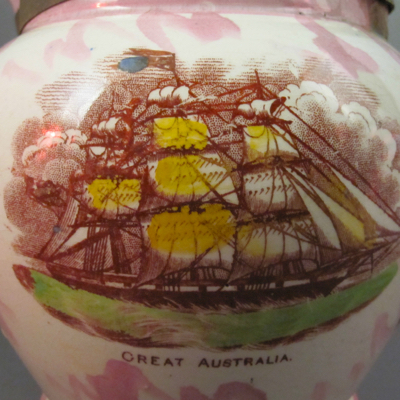 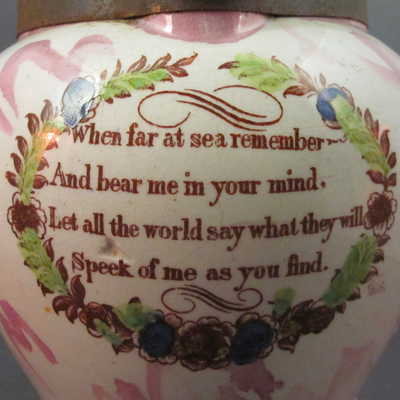 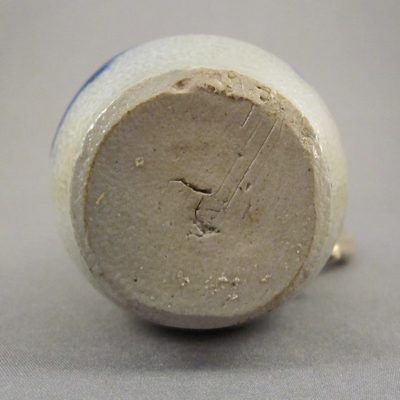 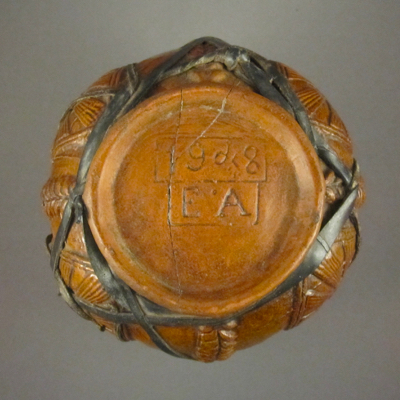 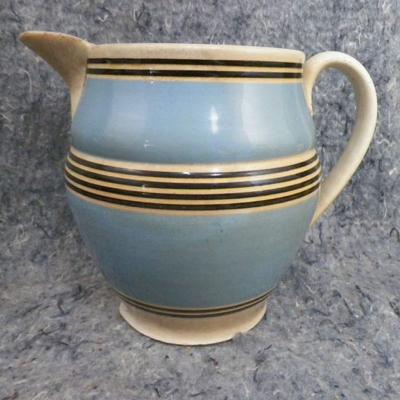 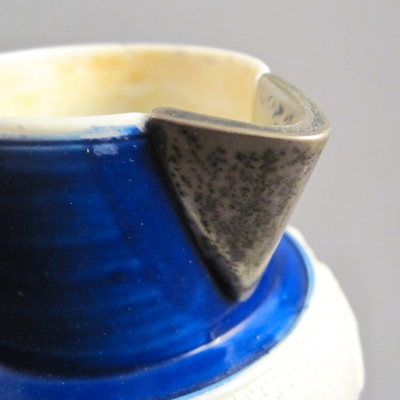 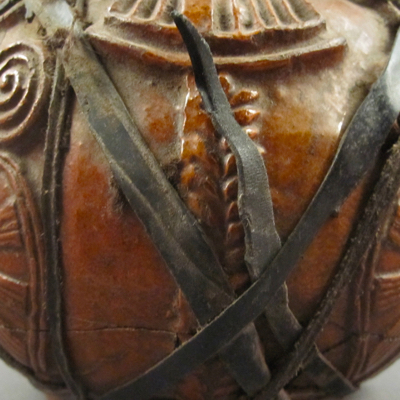 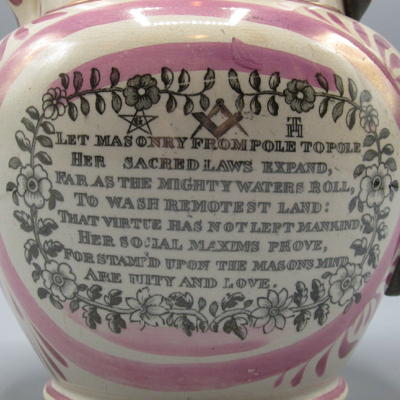 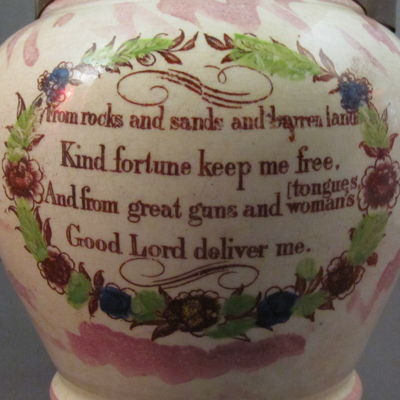 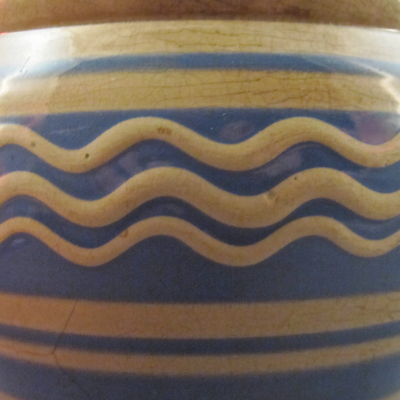 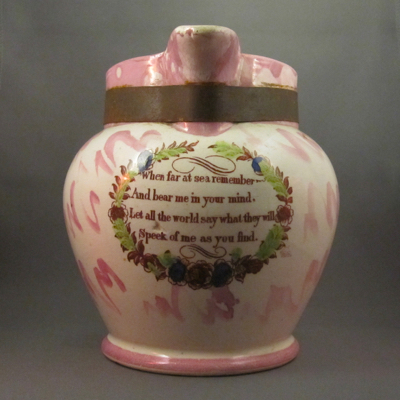 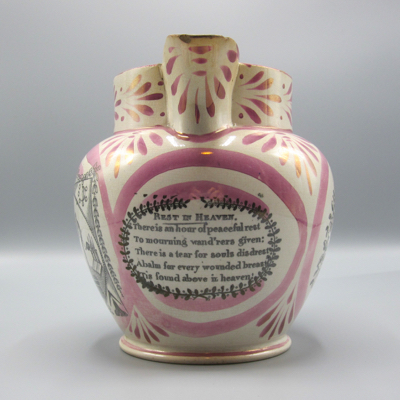 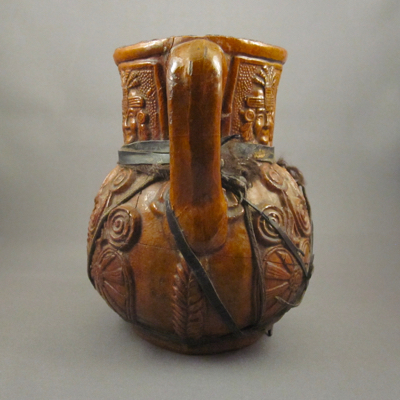 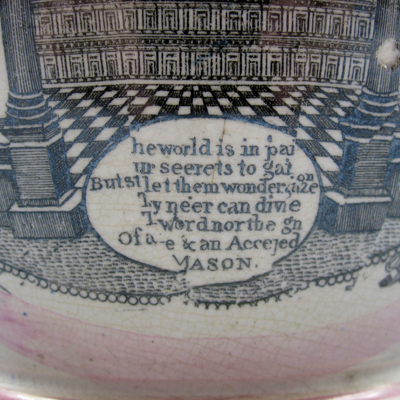 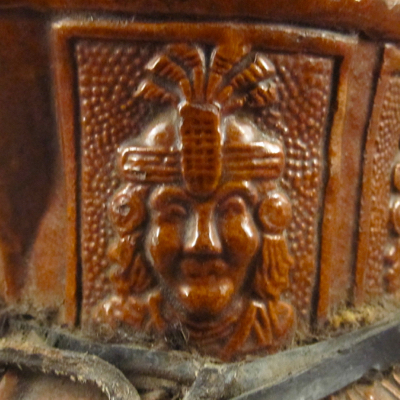 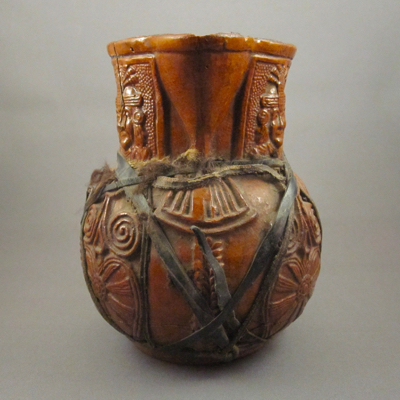 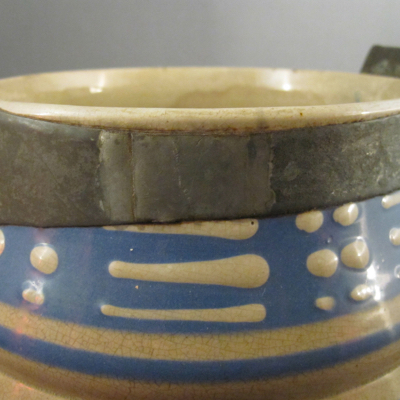 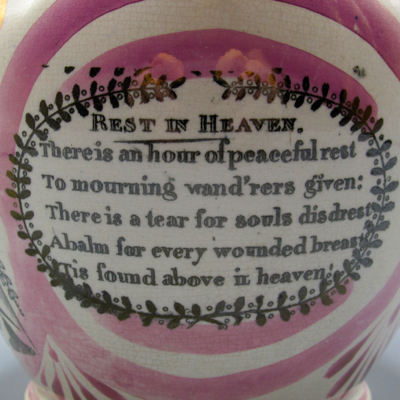 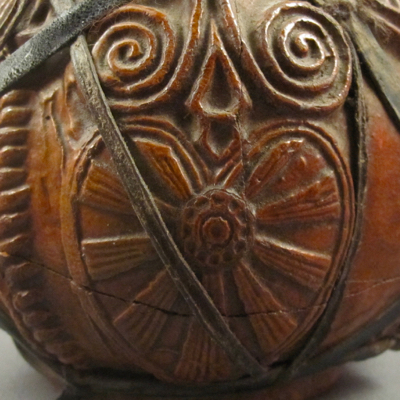 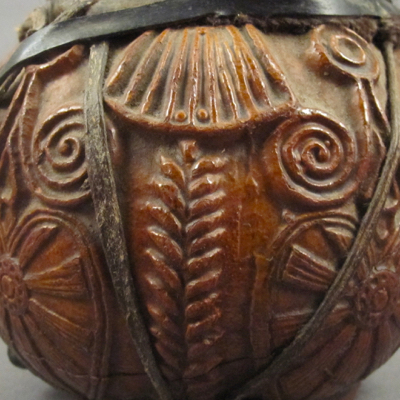 Some were made by potters as souvenirs, while others were made possibly as salesmen samples. 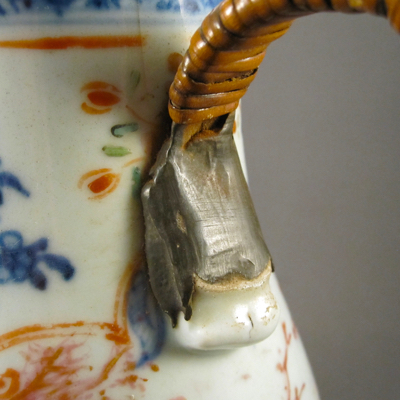 As with most pieces from my collection, we will never know how the original handle broke off. 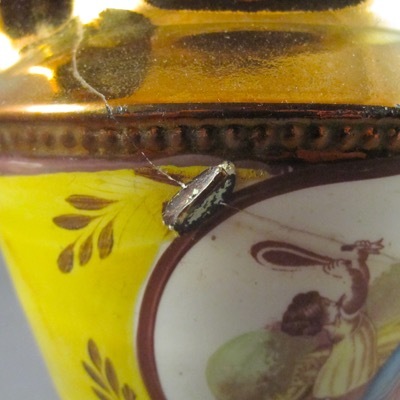 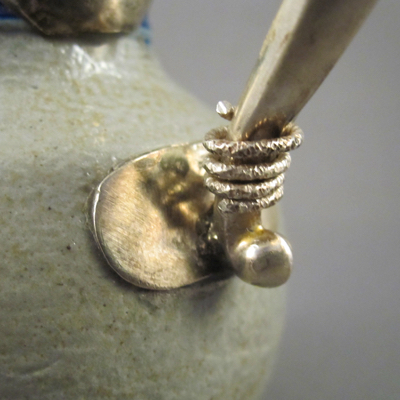 But it appears that the original owner must have truly treasured this tiny tank, as it was brought to a silversmith who fashioned a splendid silver replacement handle. 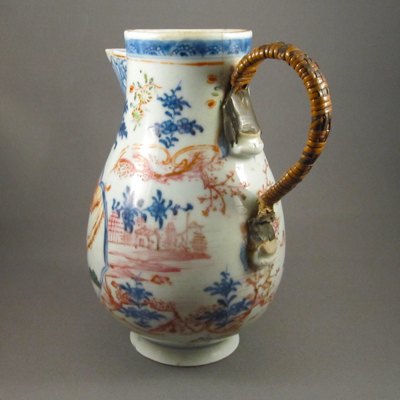 Thank you to the unknown artist who transformed a broken jug into a unique conversation piece that has lasted over 250 years…and counting. 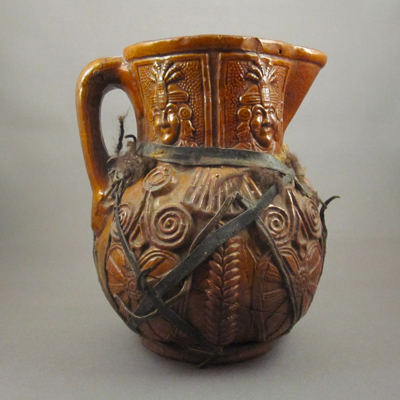 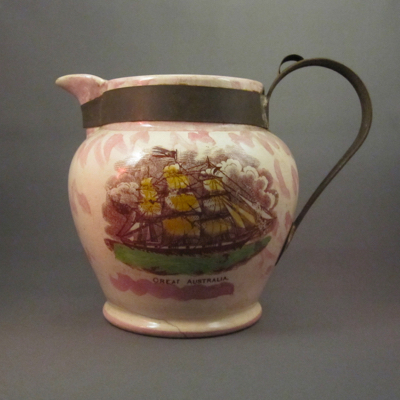 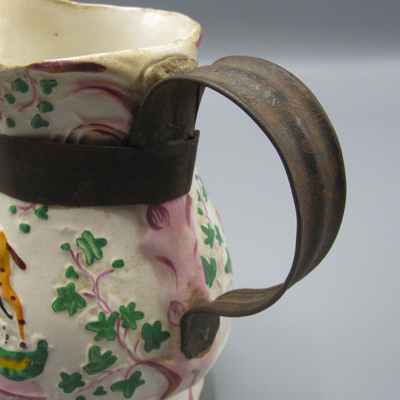 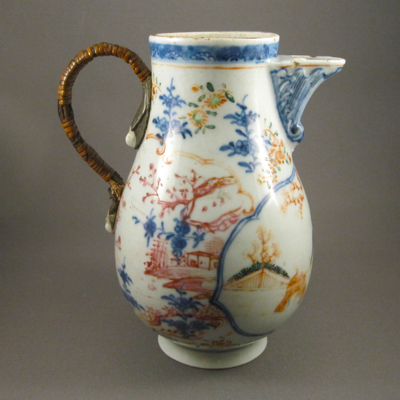 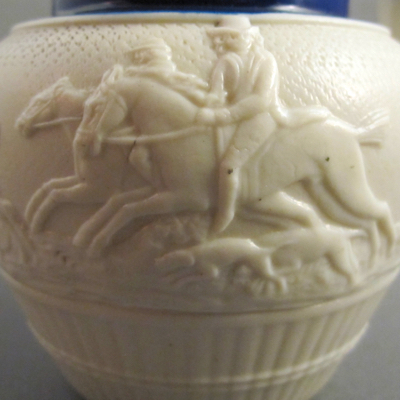 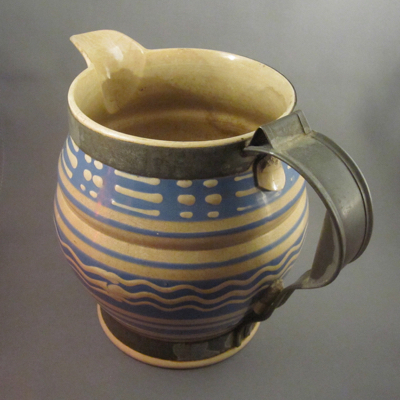 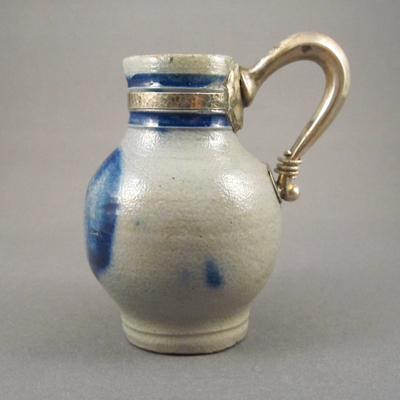 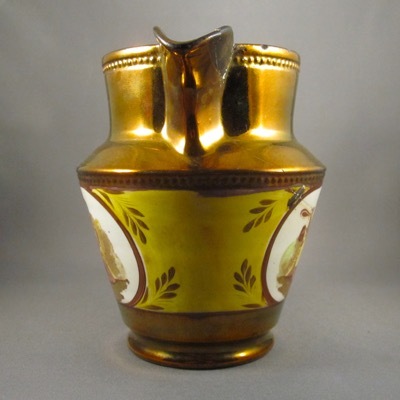 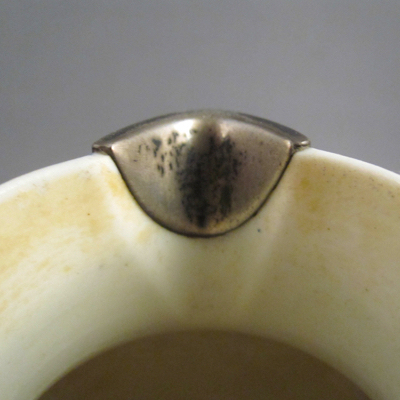 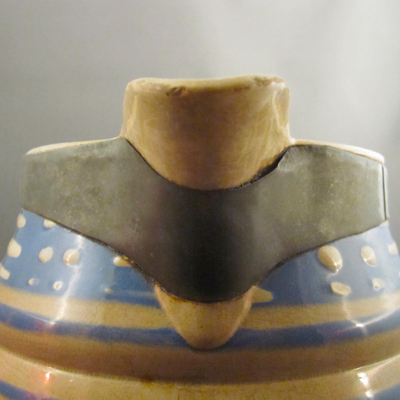 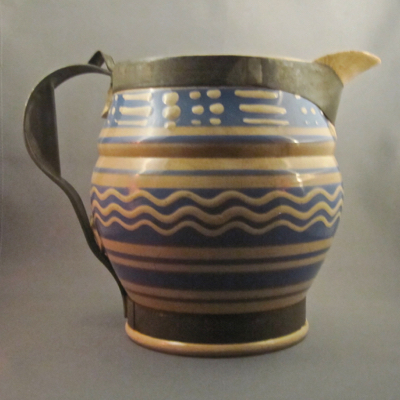 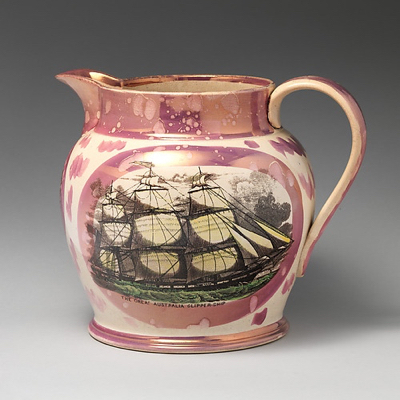 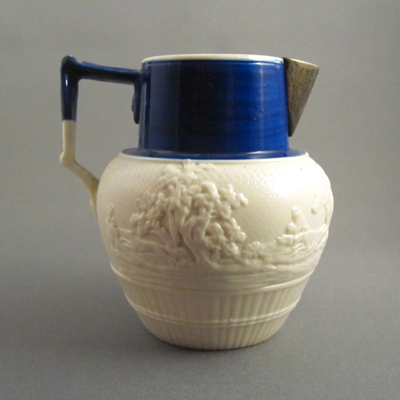 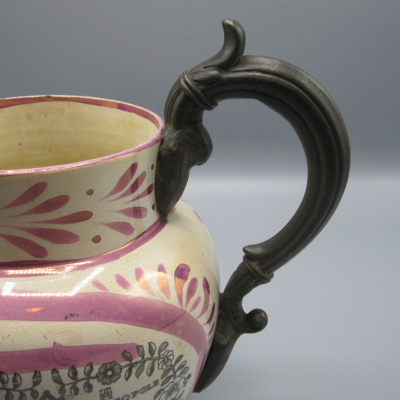 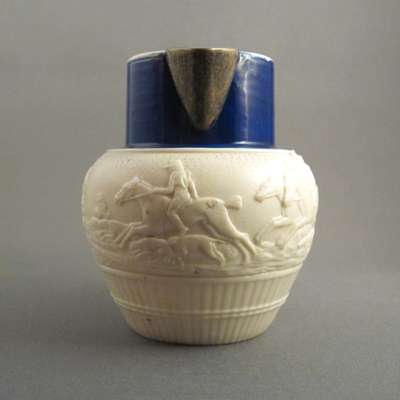 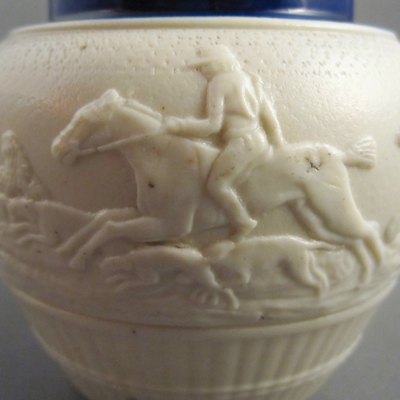 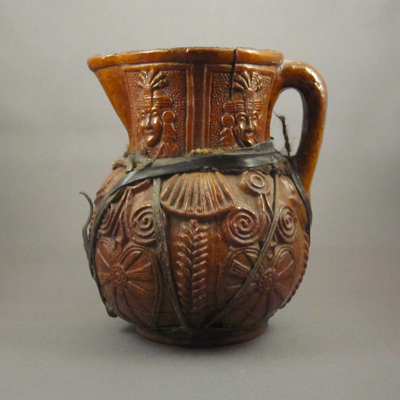 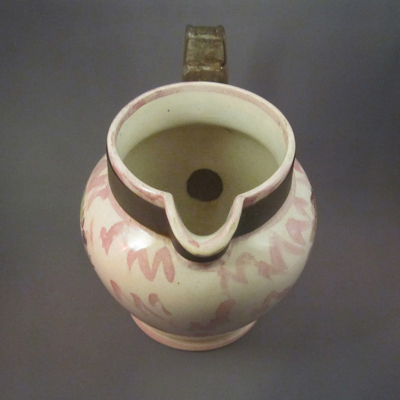 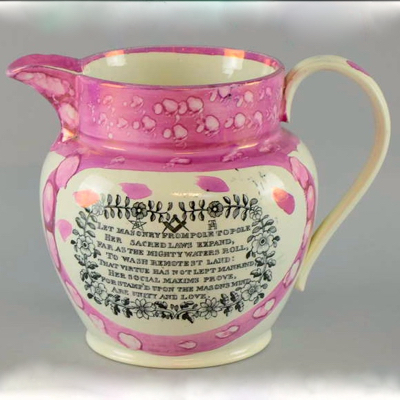 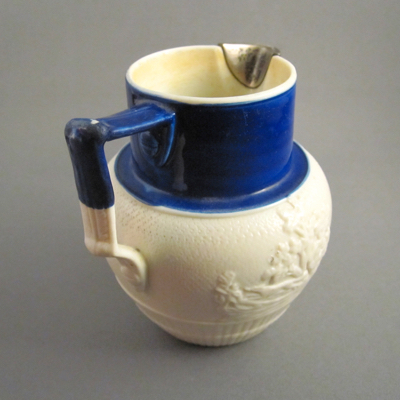 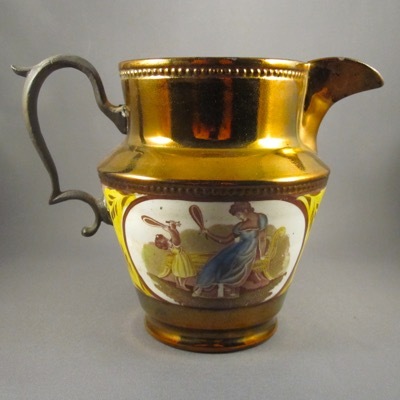 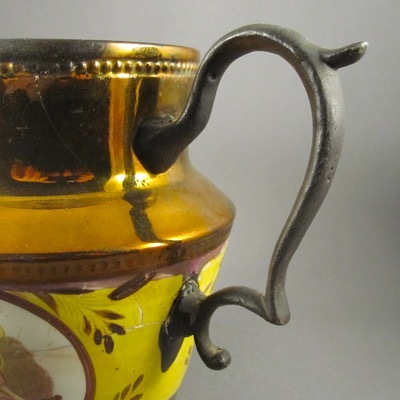 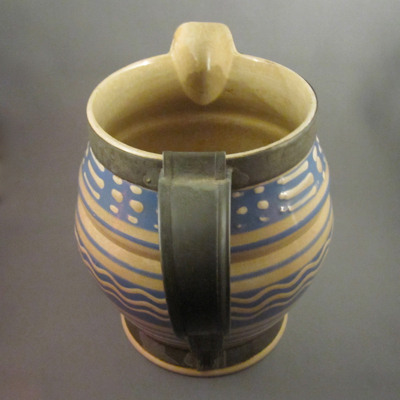 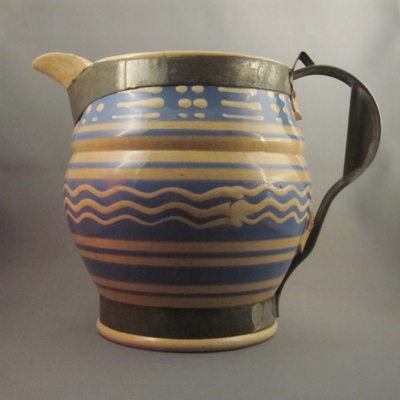 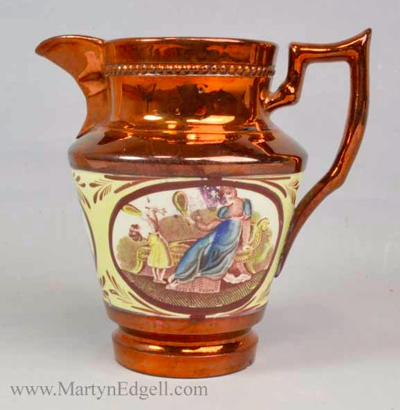 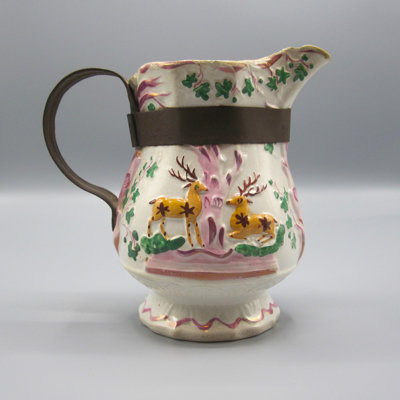 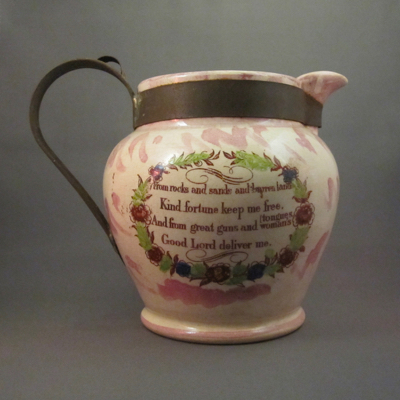 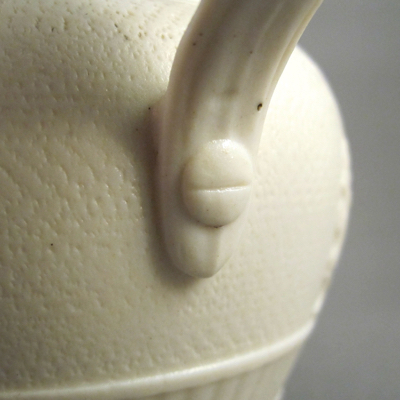 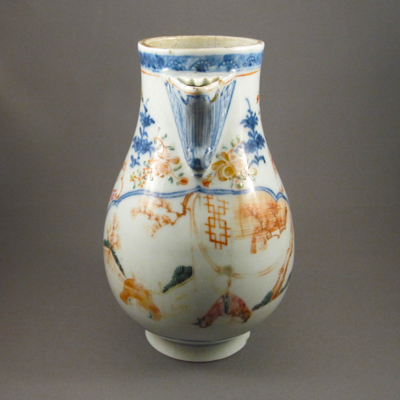 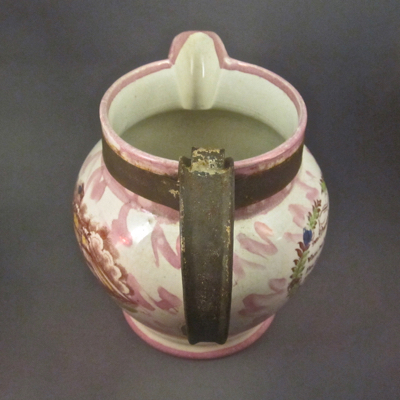 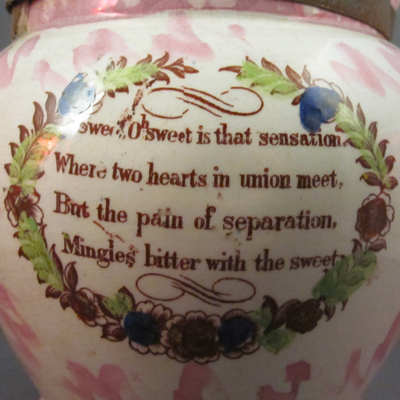 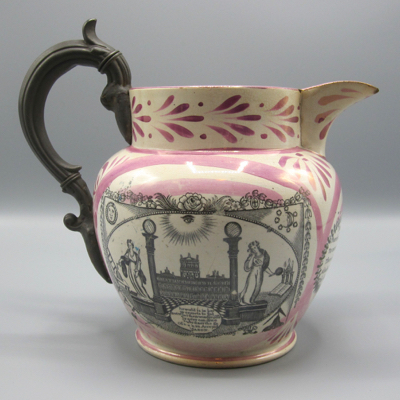 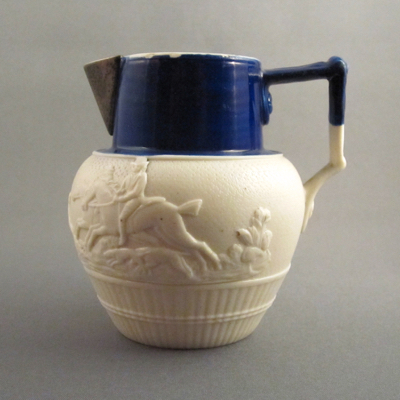 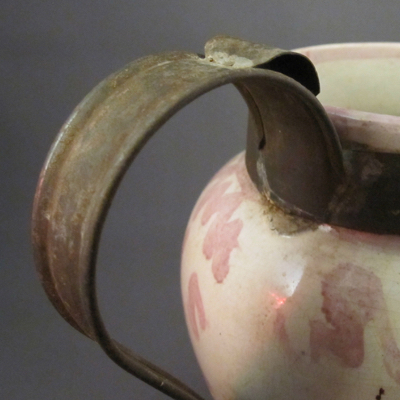 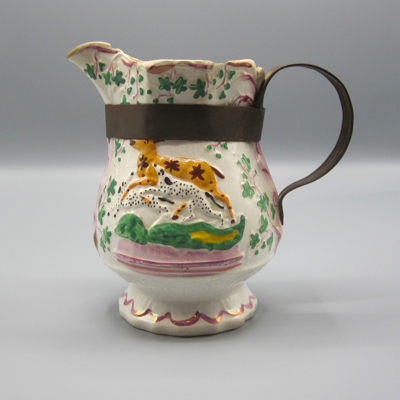 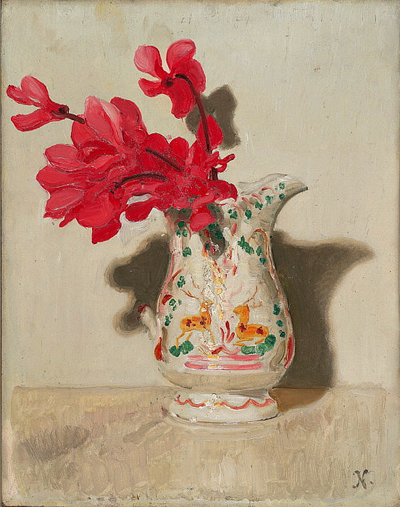 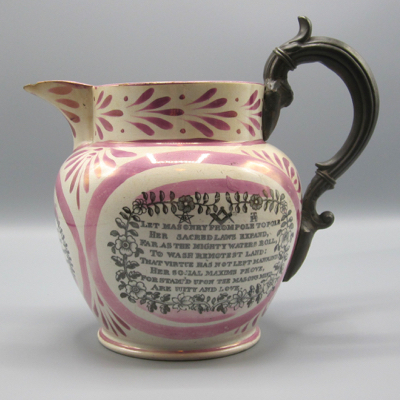 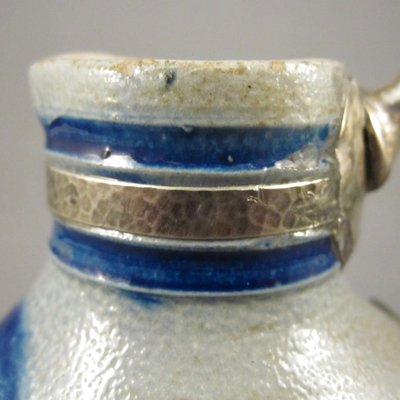 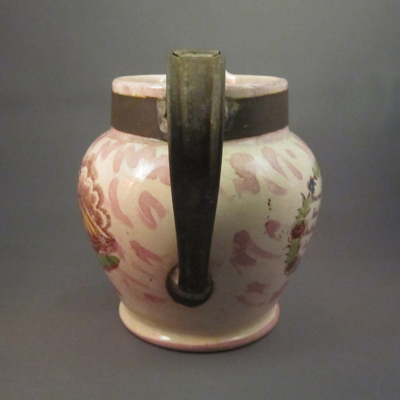 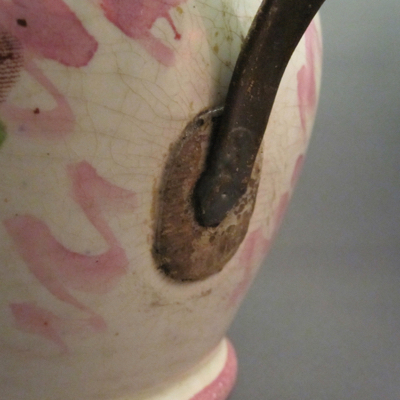 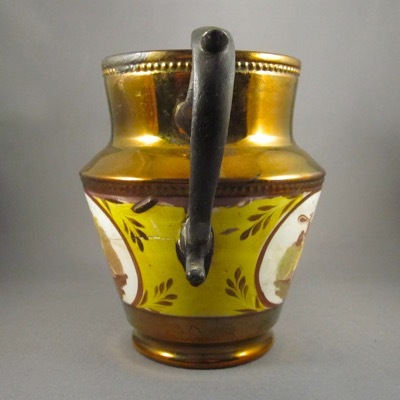 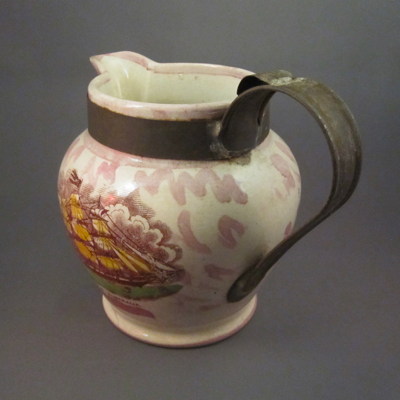 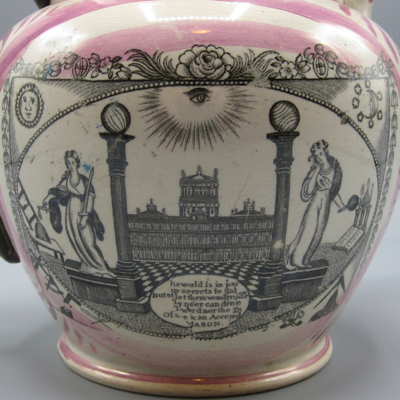 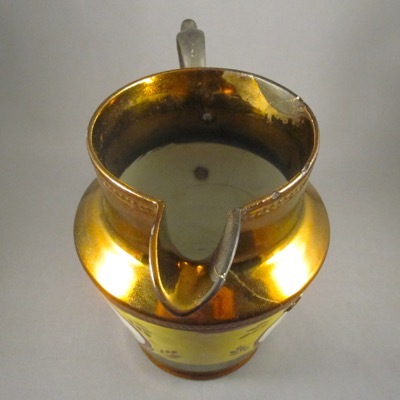 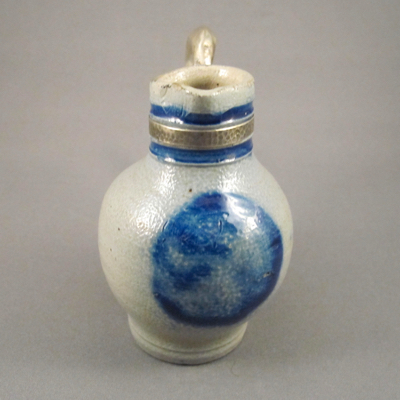 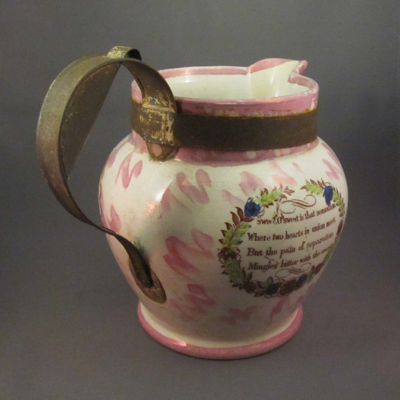 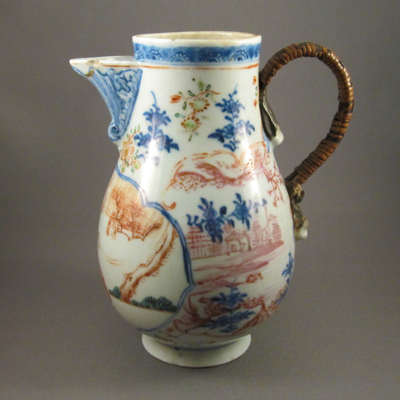 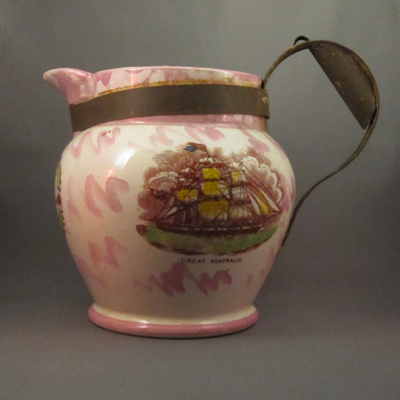 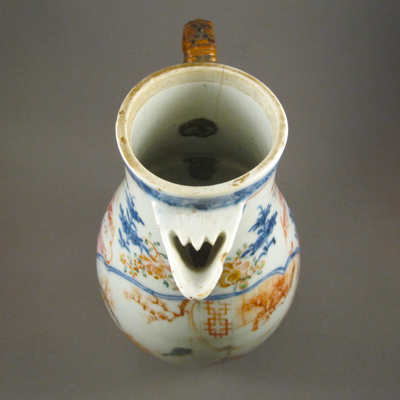 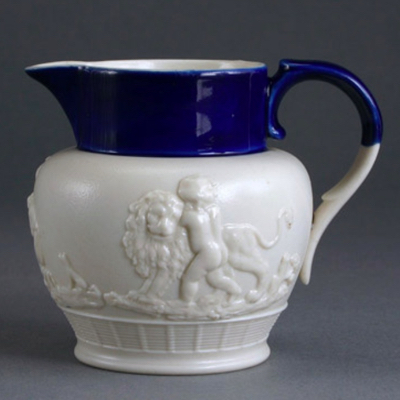 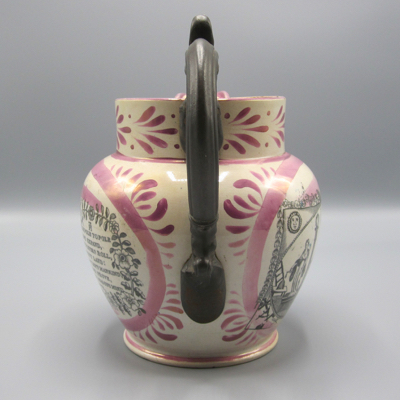 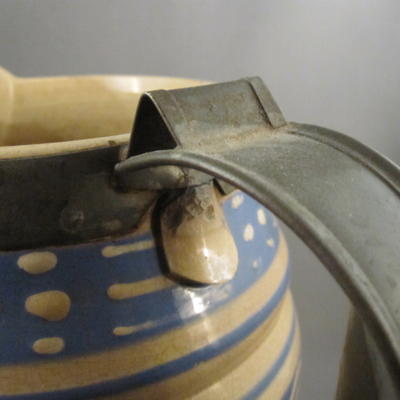 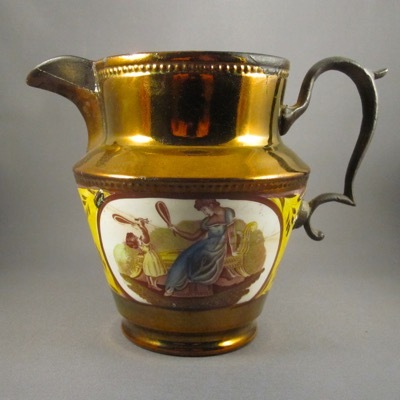 This miniature jug, with similar form and decoration, shows what the original handle on my jug might have looked like.